A group of Ethiopian refugees is calling for an international investigation into recent violence against their tribe back in Africa. The Anuak people live in the Gambella region of western Ethiopia. It's known for its fertile soil and rich deposits of gold and oil. Anuak in Minnesota say since late last year more than 400 members of the tribe have been murdered. They blame the Ethiopian government. Worthington, Minn. — As Sunday services finish members of the Worthington Christian Reformed Church file into a room for coffee and doughnuts. About a dozen kids play among the pews. Ajulo Othow heads into a quiet room, sending her son and daughter off to bible study. Othow is Anuak. 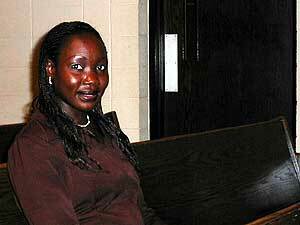 She lives in Worthington, but keeps in close touch with relatives back in Africa. They first told her of the massacre that took place on December 13th. Hundreds of Anuak were killed in the Ethiopian state of Gambella. Othow blames the Ethiopian military and she thinks she knows what's caused the violence: deposits of oil and gold in the area. "A few years ago the government tried to make the Anuak move to another a village, but they didn't want to leave," Othow explains. Many Anuak are farmers, or work in local gold mines. Tribal members tend to stay put, and many families live in the same villages for generations. For a long time relations between the tribe and the Ethiopian government have been strained, partly due to disputes over access to the areas rich natural resources. Pastor Leroy Christoffels says there are close to three dozen Anuak involved in his Worthington church. He says that brings the killings thousands of miles away very close to home. Christoffels says from what he knows it was primarily Anuak males who were dragged from their homes, beaten and killed. "The women and children were left to fend for themselves," says Christoffels. "According to what I've been told, the theory was if we kill the men and boys the women won't have any self protection or any way of living so they'll die off which will be very good." The story of December 13th trickled out slowly. But now Anuak in Ethiopia and Minnesota say their people were victims of a murderous campaign. The U.S. State Department wants the Ethiopian government to launch an investigation. Phillip Carter is the Deputy Director of the Department of East African Affairs. He says there have been varying reports of what's happened in Gambella. Some reports blame the killing on fighting between the Anuak and other local tribes. But Carter concedes he's also heard that the Ethiopian military played a role. "We've heard many of the same reports that your community in Minnesota is hearing and we've pressed the government to provide a full accounting of what's happened in the region and to bring the culpable parties to justice," says Carter. Carter says the U.S. has urged the Ethiopian government to restore order to the region, where violence continues. The U.S. is Ethiopia's largest foreign donor. According to the World Bank in 2001 the U.S. gave the country $94 million in aid. But Carter says human rights have been a long-standing concern. In a tiny Mankato apartment, college student Okony Cham visits with his friend and fellow Anuak Aphee Jobi. They share news from Gambella and review a long list of names of tribal members still missing and feared dead. Jobi says its time for the international community to intervene. "We believe what happened December 13th is clearly genocide, because when you single out a group of people within five or seven other different groups you are clearly trying to eliminate a single group and that we believe is illegal," says Jobi. The State Department has asked Ethiopia for a formal report on what's happened in Gambella. But the department doesn't know when it might receive that report. The Worthington Christian Reformed Church has taken up a collection for the Anuak. And Anuak around Minnesota continue to call elected officials, in hopes that order will be restored in their homeland and those responsible for the killings will be brought to justice.